2001 – This article concludes our in-depth reassessment of Apple’s 75 Macintosh Advantages brochure. Macintosh computers let you run more applications. You can easily work with PC files on your Macintosh. A Macintosh running Windows can share data between OS environments. A Macintosh computer can be a client in virtually any network. Macintosh computers include many features that cost extra on PCs. The Macintosh platform provides better customer support. Macintosh computers retain their usability and value longer. The Macintosh is rated more reliable for the third year in a row. Macintosh has better backward compatibility. Macintosh computers require less hardware than PCs running Windows to run similar applications. The Mac OS is more stable than Windows 95. Macintosh users are the most brand loyal of all computer users. “Dual users” prefer their Macintosh. 63. Macintosh computers let you run more applications. With Insignia’s SoftWindows application, Connectix Virtual PC software, or an Apple PC Compatibility Card installed in a Power Macintosh computer with PCI slots, you can run applications written not only for the Mac OS, but also for DOS, Windows 3.1, and Windows 95; more applications than any other mainstream personal computer. Macintosh users can run PC software and still take advantage of the unique Macintosh features. There are also other PC on Mac emulators besides Virtual PC, notably RealPC from Insignia Solutions. Another good source for emulation of other computer systems is emulation.net. That’s where I turned when I wanted to get an Atari ST emulator to open some old files on my Mac. What isn’t mentioned here is that there are a few applications that won’t run properly on Virtual PC; games in particular require high-end hardware, and some applications require access to a genuine PC parallel port (which the Mac doesn’t have and cannot emulate). Don’t forget the venerable OrangePC micro cards (discontinued), which essentially put a functional PC on a PCI card that you install in your computer. Some of these cards include the missing parallel port. In summary, however, for workaday stuff, emulation is fine for casual use but not as a replacement desktop machine. Nonetheless, it is true that including emulation, there’s a lot more software for the Mac than there is for the PC. 64. You can easily work with PC files on your Macintosh. Every Macintosh sold today comes with software that lets you read PC media and work with PC files. PC Exchange software makes it possible for a Macintosh to read and format PC floppy disks. Macintosh Easy Open will suggest a particular Macintosh application to open a PC data file type if one has not been assigned in PC Exchange. File translation is not a problem between Macintosh computers and PCs, either, since many of the most popular programs on both the Mac OS and Windows platforms; such as Microsoft Word and Excel, Corel WordPerfect, and Adobe Photoshop; have identical file formats between Macintosh computers and PCs. In cases where this is not accomplished inside an application, DataViz MacLinkPro translators, included with every Macintosh, will translate files from one format to another. Yes, readers will remind me, there are third party products that allow PCs to read Mac disks, but they aren’t installed as a default in Windows, and PC Exchange/File Exchange is part of the Mac OS. I constantly have students bringing in PC disks from home who tell me I can’t read it because I have a Mac. Then I have to tell them I can’t read it because the disk is blank – they saved their file on the C: drive instead of the A: drive. The point is, they are so imbued with the “Mac can’t” mythos that they use that as the first line of defense even when something else is wrong. It’s a serious problem that Apple has yet to face: Just as the popular image of a Mac is of an easy-to-use computer, it is just as popularly known that when things between Macs and PCs go wrong, it’s the Mac’s fault. This is a topic worthy of more discussion, but essentially the point is made. Vendors are learning that cross-platform products need to have a unified file format – and no one knows that better than Microsoft. Those which don’t can use MacLink Plus, a product I use regularly and find to be the tool of last resort for strange email formats. 65. A Macintosh running Windows can share data between OS environments. When you configure a Macintosh with a PC Compatibility Card from Apple, you essentially get two personal computers in one. The Macintosh shares a clipboard with Windows, so you can copy and paste text, graphics, and other information between the two operating systems. CD-ROM and network drives connected to the Macintosh can be mapped to drive letters on the Windows side, enabling easy common file access. Update: This one seems a little redundant with the previous item, but it is still true. It sure is handy when working cross-platform. 66. A Macintosh computer can be a client in virtually any network. 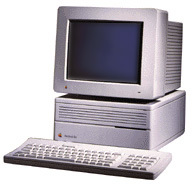 Macintosh computers can be connected to virtually any computer network system or host computer environment, often adding significant value and ease of use over other access methods. For example, Apple’s Open Transport networking architecture, with its inherent support for TCP/IP, makes Macintosh an ideal platform for accessing the Internet, as well as the perfect choice as a client to an organizational intranet. In addition, Novell NetWare and Windows NT Server support the Macintosh platform and are often popular methods for sharing information between Macintosh computers and PCs. Apple also provides a range of options for connecting with other network types, including networks supporting IBM’s SNA, Digital Equipment Corporation’s DECnet, Novell’s IPX, and other protocols. Update: There are a lot of network admins who would argue with the choice of the term “perfect” in the paragraph above. There are, in fact, problems integrating the Mac OS into a cross-platform environment. First of all, AppleTalk is “known” to be a chatty protocol. What this means is that every few seconds, every AppleTalk compliant device on your network sends out a pulse across the network announcing the fact that the device is on-line and functional. However, in a large (hundreds) of machines network, this can be an unwanted source of network traffic. TCP/IP, on the other hand, should only send out signals when information is requested, such as when you send a file or print to a TCP/IP compliant printer or print spooler. Invariably comments about AppleTalk chattiness brings a rebuttal from a Mac user who claims that AppleTalk is perfectly well behaved when configured properly. That’s the problem though, isn’t it? I am unable to find any tutorials on the topic and am not knowledgeable enough to argue the point with any network admin. If it’s not that easy to configure then it’s really not up to Apple’s ease of use standard, now is it? The number one way they should deal with it is that proper Mac integration training should be implemented in all Microsoft-sanctioned NT training sessions. This should be a topic of discussion the next time the two companies negotiate on any substantive topic. Too many managers are coming out of NT school drilled with the idea that the only function of Apple is to serve as Microsoft’s monopoly defense and advanced research center. The other problem is what I call That Desperate Search. When a company (or a school district, for that matter) is about to go all-PC, they need to have justification for getting rid of the Macs. How do they do this? They go on That Desperate Search for An Application That Won’t Run On A Mac, Even In Emulation. This may involve an upgrade not tested on the Mac clients that goes bad when implemented or a decision from purchasing or accounting that requires all secretaries to use a certain enterprise app that only runs on Windows. When the secretaries switch, the worker bees are not far behind. When they find that app, the Macs are gone. Solving these sorts of problems is a common topic on the Mac Evangelist and the Mac-Managers list. Furthermore, the number of hosts that a modern PC can connect to is greater than it is for the Mac. The best thing the Mac users can say is that in normal situations, they should be easier to configure than a PC; but the PCs are definitely able to connect in more environments than the Mac. Advantage: Neutralized – if it ever existed. 67. Macintosh computers include many features that cost extra on PCs. It’s a common belief that PCs cost less than Macintosh computers. But while some PC clones offer a lower “base price” than Macintosh computers, a feature by feature comparison shows that Macintosh computers provide the better overall value. That’s because Macintosh computers include many key features that either cost extra or simply aren’t available on most PCs, such as networking, SCSI expansion, high quality video, sound, Apple Desktop Bus expansion, and in some models, video in and out. Update: Macs used to be more highly priced out of the market than in recent years. This is undoubtedly due to the adoption of industry-standard technologies such as USB and internal IDE drives. In the recent past I’ve seen articles that fall on both sides of the fence. For example, arguing that Mac desktops are more expensive than they need to be, see There’s no middle ground when it comes to a Mac. Then again, arguing that Mac laptops are more cost effective – a lot more cost effective – than their PC counterparts, see NEC Launches New Laptop: 1 Pound Lighter than the iBook, but with a Catch. Generally speaking, you can get a low-end PC cheaper than any Mac. But if you compare off-the-shelf systems that are equivalent in terms of specifications, you will generally find that desktop PCs are cheaper than Macs. You can argue that the PCs are missing features such as dual-USB ports with independent power (as opposed to two ports on the same bus). You can argue that Mac users are unfairly counting things missing on the PC when not adding in important and groundbreaking technology missing on the Macs such as floppy drives. Oh yeah, and serial ports. And, of course, the feature set has changed since the original advantages article was written. SCSI is gone, as is the Apple Desktop Bus (ADB). The crux of the matter is this: Macs are more expensive than off the shelf PCs in some, but not all, cases. But feature-for-feature, when made equivalent by adding on devices, Macs are a better value. If you’re a build-it-yourself PC person, you’ll obviously put in an empty shell exactly those things you need and no others. If you want your machine to actually work, you’ll buy a machine which has many of these things preinstalled or integrated into the motherboard. Another issue along these same lines is the Total Cost of Ownership (TCO). Including tech support and downtime, several studies show that Macs are cheaper to own over time than PC’s despite their higher initial cost. An excellent summary of the available literature on this topic can be found at John Droz’ excellent Mac advocacy site. 68. The Macintosh platform provides better customer support. PC World, “Goodbye to Good Support,” December 1996, page 145. Home PC Magazine, “The Best in Customer Support,” November 1996, page 158. InfoWorld, “Best of 1996: Technical Support Award,” January 31, 1997. Update: Apple recently won a ZDNet Support Star award, narrowly beating Dell. (Apple and Dell both were cited by ZDNet as being superior to all other vendors.) The details of the Apple evaluation are located at this site. The summary table shows scores for all vendors. Aside from these survey questions, there are undoubtedly anecdotal stories that show poor support from Dell and Apple, as well as other vendors. The reasoning used in the original advantage still holds, however: as the only manufacturer able to offer hardware, OS, and software support for many of the major applications, Apple enjoys a unique position in the industry. 69. Macintosh computers retain their usability and value longer. You don’t have to buy a new Macintosh every few years to keep up with the latest software technology. This is not true with the Windows market. Most PCs sold just three years ago are unable to run Windows NT 4.0. Many PCs sold just five years ago cannot run Windows 95. But the Macintosh IIci, which was introduced in 1989, can run Mac OS 8 today. Computer Intelligence Installation Database, October 1996, and NFO Consumer Panel Survey, October 1996. Figures based on calculations from United Computer Exchange’s PC Appraisal software. These selections are based on the minimum system requirement definitions of a Windows XP and a Mac OS X system as detailed on Microsoft’s and Apple’s websites. Both computers will require RAM upgrades – and hard drive upgrades are probably not a bad idea, either. OS X users, of course, also get OS 9 along with OS X, so two operating systems coexist on the same machine. It should be noted that this is not a scientific survey; there are undoubtedly special sales or other vendors which will shift the results one way or another, but not, I believe, enough to alter the basic conclusion: Macs retain a higher resale value longer than an equivalent PC. I think the point about not being able to run the latest Windows on older machines is true in some cases, but my example certainly shows that systems exist to the same standard as Apple holds itself at present. By the way, in my used-and-donated Power Mac computer lab, all machines are running Mac OS 8.1 to maintain the maximum in compatibility with software but get the best possible speed out of the system. I wrote an article about downgrading to get better performance a while back discussing this topic. For computer owners, the message is clear: A Mac retains its resale value longer than a PC. For computer buyers, the message is: cheap PC’s can be purchased in bulk in the used market. G3/233 statistics were from the Low End Mac G3/233 page. At the time of this writing the DeskPro sale price was available from Electro Rent Corporation. The DeskPro was first manufactured in July 1997 as far as I can tell from Compaq’s site. DeskPro original sale price is documented in PC Magazine. 70. The Macintosh is rated more reliable for the third year in a row. This means that you can purchase a Macintosh with confidence, knowing that you will be more productive than those with PCs who are left holding on the phone to the repairs department. * PC World, “Goodbye to Good Support,” December 1996, page 144. Update: Interestingly, PC World no longer includes Apple computers in its annual survey; I searched back through 1999 and could find no mention of Apple Computer anywhere in the articles. Barring any contradictory evidence from PC World, I cite the ConsumerAffairs.com report as evidence to leave the advantage with Macintosh. 71. Macintosh has better backward compatibility. The Macintosh has long provided excellent backward software compatibility, ensuring that users can run their older software on new Macintosh models or on new versions of the Mac OS. Even as Apple was transitioning to the PowerPC processor with its RISC architecture in 1994, we made certain that the new computers would run older software. And we will continue to provide this backward compatibility in the future. The Windows world does not have this same assurance. Every new version of Windows has included features that make backward compatibility of existing applications an issue. What ran on DOS or Windows 3.1 didn’t necessarily run on Windows 95; and DOS, Windows 3.1, and Windows 95 software didn’t necessarily run on Windows NT. The advent of the Intel MMX processor also makes it necessary for users to abandon current software for rewritten MMX versions. When combined with changes in Windows, PC users are caught in a never-ending struggle to keep their brand new computers working with their software; a complex and expensive proposition. To transfer to PowerPC (PPC) processors, Apple included emulation software to allow the older 68k software to run on a PPC in emulation. This is why most of your older software works on a newer Mac. Much software designed during the transition period was “Fat binary,” which means that it runs on PPC and 68k machines -and users had the option to leave out whichever code they didn’t need to save space. The transition from System 6.x to System 7 was accomplished smoothly, while the transition form System 7.x to 8 and then 9 was almost unnoticeable. Applications designed for System 6.x usually run in OS 9 – except for those that were out of spec and made specific hardware calls, such as some games. Applications that run under OS 9.1 are virtually guaranteed to operate in OS X with Classic compatibility mode. One of the design goals for ASP.NET is to make the new platform backwards compatible with previous versions of ASP. However, it became clear during development of the product that total backwards compatibility would not be possible if ASP.NET was going to become a powerful, robust environment for next-generation World Wide Web development. At present, there are many more years ahead of the Internet than behind it, so a decision was made to relax the compatibility requirement in order to create a superior development and deployment environment. This tells you a bit about Microsoft’s attitude toward backwards compatibility. My wife, who uses a PC due to the requirements of the users she corresponds with (the main one being they go ballistic if she sends them files from a Mac), has recently gone through a typical problem caused by ignoring or deliberately sabotaging backwards compatible software. Upgrading from a Windows 3 PC to a Windows 98 computer, she found that one of her applications no longer functioned on the new computer. She dutifully upgraded to the latest versions of software, only to discover it no longer would read the older file formats. (This is all about Print Shop, in case you care.) Don’t get her started on homestead.com, either. Readers are invited to share their insights on this topic in the message boards. 72. Macintosh computers require less hardware than PCs running Windows to run similar applications. And an old video card, BIOS chip, and hard disk drive might not be sufficient enough or might not even work with Windows NT because of driver incompatibilities. * PC Magazine, “The Big Business Upgrade,” by Jim Seymour, September 10, 1996. Advantage: Neutralized due to increased system requirements for OS X. 73. The Mac OS is more stable than Windows 95. And the new Mac OS 8 makes the Mac even more stable by providing numerous reliability and stability improvements. * Evans Research Associates, “Personal Computer Satisfaction,” May 1996, available on: http://www.apple.com/whymac. Update: Well, I think this may have been true in 1995, but everything I read says that Windows 98 has improved stability a great deal. So has Mac OS 9.1 over OS 8. The jury’s still out on OS X, although it is apparently true that what problems do exist seem to originate with Classic software. I just was not able to find any documented comparison of stability issues between OS 9.1 and Windows 98 or anything later. I think the fairest thing to do here is simply leave it as undetermined at present. Advantage: Too soon to say. 74. Macintosh users are the most brand loyal of all computer users. One excellent indication of user satisfaction is brand loyalty; how likely a user is to buy their next computer from the same manufacturer. According to a study conducted by Computer Intelligence in June 1996, Apple is the number one computer company worldwide in brand loyalty. In fact, an astounding 87 percent of Macintosh users repurchase Macintosh computers, far more than any other vendor. Update: Mac users are like Star Trek fans: We pay money to go to large darkened halls where the people who sell us the stuff we buy tell us how smart we are. This number cited above (87%) has declined over the years, and was described in some detail in an article by Dan Knight in Survey Says…. Dan explains there is real reason for concern here, and he makes points in this article that are hard to ignore. Nevertheless, if it’s a foot race, Apple still wins – but not by as much as in the past. 75. “Dual users” prefer their Macintosh. Perhaps the best comparison of Macintosh computers versus Windows based PCs comes from users who know both systems very well. Evans Research Associates found in an independent study that “dual users”; those who routinely use both Macintosh computers and PCs running Windows 95; preferred the Macintosh in many important categories, including productivity, satisfaction, ease of use, multimedia, and more. * So before you buy your next computer system, make sure to do a hands-on test of both a Macintosh and a Windows based PC. That’s the best way to truly understand the Macintosh Advantage! * Evans Research Associates, “Personal Computer Satisfaction,” May 1996. Update: Again, this advantage is in need of updating. This fall, my school’s technology plan will place a new Dell OptiPlex and a new iMac in every classroom. The teachers will use what they will use. I’ll report on how it turns out later, but it should prove to be an interesting experiment. We have Mac advocates on staff (obviously), but we also have PC advocates and a considerable number of neutral parties. Nevertheless, I see no information either to support or challenge this claim on the various sites for Mac advocacy on the Web. If you know of a more recent study than this one, drop me a note. In the meantime, we’ll go with the only source of information we have, the original 1996 study, and call it a weak Advantage. We’ve moved the summary to a separate page, which also functions as an index to this series of articles.